3 monsters Once per turn: You can target 1 face-up monster on the field; negate that target’s effects until the end of this turn. Once per turn, if this card battles an opponent’s monster, during damage calculation (Quick Effect): You can Tribute 1 monster this card points to; this card’s ATK becomes double its original ATK during that damage calculation only. Powercode Talker starts off the week on Pojo, another of the “Talker” line of monsters. Three monsters like Decode, but any three will do, so no effect monster requirements, meaning tokens people. Effect negation for the turn once per turn is great. Pop a monster Powercode points to, double Powercode’s ATK for the damage calculation is really good. When you can make this card with Scapegoat and get a 4600 monster for a turn all with one card that isn’t restricted in any way, then it is very good. It would be a lot better if the negation effect wasn’t Ignition, but this card can help negate cards like Firewall and the Knightmare monsters during your turn. While Decode could get a boost in ATK via monsters it pointed to, all you have to do is keep a monster in a zone Powercode points to and you are always available for that double ATK effect. You can direct attacks away from Powercode this way and set up popping monsters to get effects off of them. The arrows hold it back a little, as you’ll only have one arrow if you have this guy in your Extra Monster Zone, but one may be enough for that effect. Happy Monday! PowerCode Talker is a Link 3 Fire Cyberse-type Link Monster with 2300 Atk and Left, Right, and Down Left Arrows. It requires 3 monsters to properly Link Summon something with lowish Atk. The other stats are necessary when running Cyberse except for the attribute which doesn’t really matter. The arrows are better in the Main Monster Zone than in the Extra Monster Zone particularly for its second effect. That second effect of Powercode Talker is to be battling an opponent’s monster and double its attack at the cost of a tributed monster. The tributed monster must be in a zone Powercode points to. Unfortunately, the effect only lasts during the damage calculation of the one battle. Tributing a monster might not be worth 2300 Atk during one attack that cannot be direct. Anyway, the first effect was to negate a targeted face-up monster’s effect for one turn once per turn. It doesn’t destroy and it’s not a Quick Effect, so I’m kinda left with 2 meh effects on a monster that requires 3 monsters. Powercode Talker should have had a little burn on either effect to make it worthwhile. As it is, you can run it in the Extra Deck if you’re missing something else. 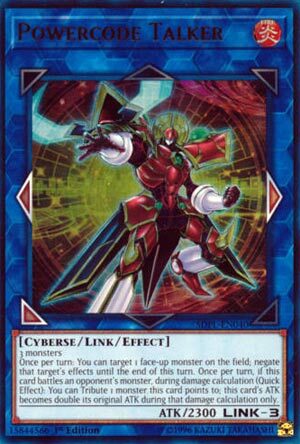 Or run it in Cyberse because it’s another viable summon in that deck. Score: 3/5 Attack boost should have lasted longer. Art: 3/5 I like it enough. Looks like we will dive into the new Cyberse Structure Deck this week starting off with the newest Code Talker monster, Powercode Talker. Powercode Talker is a Link-3 Cyberse with 2300 ATK that points Left, Right, and Bottom Left and requires 3 Monsters. No cheating with a Link-2 and something else, but at least the monsters can be anything, arrows are preferred for the Main Monster Zone but can work in the Extra Monster Zone, 2300 ATK is average for a Link-3 and Cyberse is getting a good amount of support. Once per turn, you can target a face-up monster on the field and negate the target’s effects for the turn. Negation is solid to have overall, but this would of been a great Quick Effect. The Quick Effect on this card is that when this card battles an opponent’s monster, you can tribute a monster this card points to in order to make its ATK double its original ATK during that battle. 4600 ATK is nothing to laugh at, even though you are tributing a monster. Borreload Dragon is better when it comes to outing bigger monsters, but it is a Dragon and some of the Cyberse cards will lock you into summoning Cyberse Link Monsters, so this still has a point, along with synergy with other Cyberse cards. Powercode Talker could of been near staple if the negation was a Quick Effect, the 3 monster requirement could of been gotten around, but it is still worth having in the Cyberse toolbox since it is a solid Code Talker. Art: 3.5/5 Red is my favorite color, but I feel the other Code Talkers have better art. Structure Deck week, eh? Powercode Talker is Link 3, with 2300 attack, and Fire type, with arrows that point to the immediate left and right, as well as the bottom diagonal left. Needing three generic Monsters for a Link summon is a plus, but now we see if this Monster is worth the investment. Starting off, once a turn, you can target a face-up Monster to negate its effects until the end of the current turn. Certainly useful, knowing there’s one less threat or effect for you to worry about, and it should make it easier for you to destroy that Monster. Furthermore, once a turn, during Damage Calculation (as a Quick Effect) you can Tribute a Monster this card is linked to, and Powercode has his attack doubled. Original attack, that is, but still, 4600 attack is nothing to scoff at. It does perhaps seem a bit of a waste just for an attack boost, even one on such a big scale. But it can still get you some advantage I suppose, and it might help you to get Monster (whatever it is) in your Graveyard. It’s a good card, it’s not great or broken, or anything, but it’s still good.